[SXRguyinMA] built a replacement top bezel for his computer case. He wanted to add vents that would automatically open or close based on the cooling needs of the computer. With some careful measurements he modeled the parts in Sketchup and sent out for them to be cut from styrene with a water jet cutter. The parts came back looking great and the assembly of the shutters went swimmingly. The bezel also includes a lighted screen for temperature information, as well as the front USB ports, headphone and mic jacks, etc. Hidden underneath is an Arduino board and servo motor. The Arduino polls the temperature and drives the servo to adjust the fins accordingly. There’s even a supercap in the circuit that will close the vents when the PC powers down or when power is unexpectedly lost. See it in action after the break. Many exercise machines generate electricity as you pedal or climb in order to run the on-board electronics. Unfortunately if you stop or even slow down too much the juice will die and your exercise program will reset. 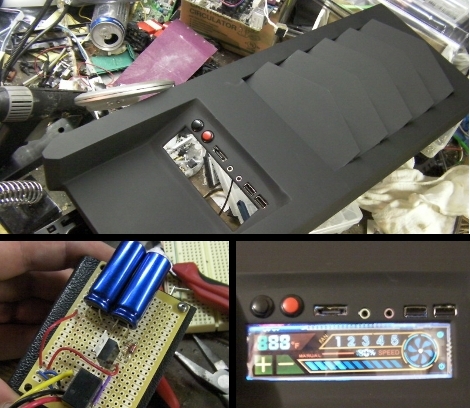 Wanting to improve on this gotcha, [Mike] cracked open his exercise bike and added some super capacitors. On the circuit board he found an ATmega128 was in charge of the user interface. He probed the board a little bit and couldn’t find how it was connected to the power regulators. After some additional snooping he found it has its own SOIC regulator separate from the ones that run the display and peripherals. He takes us through the calculations he made before choosing his parts. What he ended up with is a set of three supercaps in series that add about two minutes of juice before the levels drop and the chip resets. 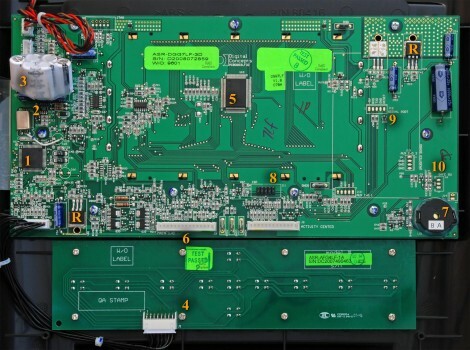 The design of the board helped a lot as the high-load electronics (like the LCD screen) are on a separate power bus than the processor.